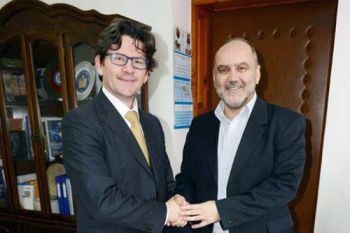 Dr Ivan Sikora visited the University of Sarajevo (UNSA) and the Dzemal Bijedic University of Mostar last month as part of promotional events to support the Erasmus Mundus program. Dr Ivan Sikora, Programme Director of the MSc in Aviation Safety Management and Senior Lecturer in the School of Mathematics, Computer Science and Engineering, represented the University on the 3rd and 4th December last year, as part of a series of 'Info Day' sessions held at the University of Sarajevo and the Dzemal Bijedic University of Mostar in the Western Balkans, to promote the SIGMA Agile Erasmus Mundus Action 2 project. The Erasmus Mundus program is a European Commission-backed initiative aimed at enhancing the quality of higher education and promoting dialogue between cultures through the mobility of students and academics. The SIGMA Agile project is geared to higher education institutions in the Western Balkans and makes approximately 150 fully funded scholarships available to academics and students of partner universities. The University of Sarajevo has recently secured the rights to participate in all approved projects of the Erasmus Mundus programme's Action II last round. "I am excited about City's participation in this programme especially given the high calibre of students and academics involved. The Erasmus Mundus programme is of great benefit to all of our participating universities." Students from EU partner universities currently studying at the University of Sarajevo and the university's students participating in Erasmus Mundus projects shared their experiences during Dr Sikora's visit. For more information on the Erasmus Mundus programme please visit this link. Please visit this link for more information on the SIGMA Agile programme.